This course is intended to review the basic skills of bowling, and refine them, moving the student toward a higher level of bowling performance. These include, but are not limited to, the mechanics of good bowling form; ball selection; stance, approach, and delivery of the ball; how to analyze the delivery and make appropriate adjustments; concentration, both mental and visual; the "mental game"; and a review of score keeping; bowling terminology; and, lane courtesy. There will be a large focus on hitting the target arrows: the 2nd arrow from the channel for strikes, and the 3rd arrow for most spares. Review and refinement of basic fundamentals of bowling. Emphasis on target spot bowling, adjusting for lane conditions, choices in equipment, league play, and mental training. PREREQUISITE: Bowling I or competitive league experience. *Execute and analyze effective bowling form and ball delivery..
*Roll the ball directly over the appropriate target arrow on the bowling lane at least 65% of the time, 13 out of 20 attempts. *Name and understand the components of an effective ball delivery, including the stance, approach, ball swing, and follow through. *Understand and demonstrate how to throw an accurate hook, especially on a strike attempt..
*Understand and customize effective spare attempts. *Review and clearly define such bowling terms as: strike, pocket, headpin, spare, split, turkey, frame, open frame, handicap scoring, mark, push-away, release, hook ball, scratch bowler, targeting, squaring up, target arrow, spot bowling, pin bowling, slide foot, slide step, drifting. *Correctly determine a bowler's handicap for scoring purposes. *Note: To receive an A or A- grade in this class the student must be able to hit the appropriate target arrow 13 out of 20 attempts, 65% success minimum. Solidify sound mechanics of ball delivery, including throwing a hook ball on the strike attempt. Increase bowling score and scoring consistency. Impress upon students that Bowling II is a serious class, not a "Mickey Mouse course" for an easy “A”. Students will understand the need to be at class when class starts. Cell phones not to be used for calls or texting during class time. Students will understand that class ends at ten minutes to the hour. A personal goal for Mr. Gorman: Work towards claiming all tens spots on the “High Score Board” at MU Lanes with students from his classes. Individual Scoring sheet (40 points) w/ Handicap Calculation handout on backside. Video Links I handout. Quiz on videos next class meeting. Hand-written notes may be used. Prior to next class students should read and print out "Bowling Skills Checklist" available on Blackboard. WEEK 2 Quiz 1 (10 points). Review Session 2; hook vs. straight ball hand position; bowling mechanics & form. Discuss and demonstrate skills on "Bowling Skills Checklist". Prior to next class students should read and print out "You Tube Bowling Videos II" and "The Seven S's" available on Blackboard. Hand-written notes from the YouTube videos may be used on the upcoming quiz. WEEK 3 Quiz 2 Videos II (10 points). Review "Seven S's" handout; bowl for score. Review adjustments; Bowling Skills Checklist; bowl for score. Prior to next class students should read and print out "The Four Cornerstones of Maximum Bowling Performance" available on Blackboard. WEEK 4 Quiz 3 Grading and Seven S's (10 points). 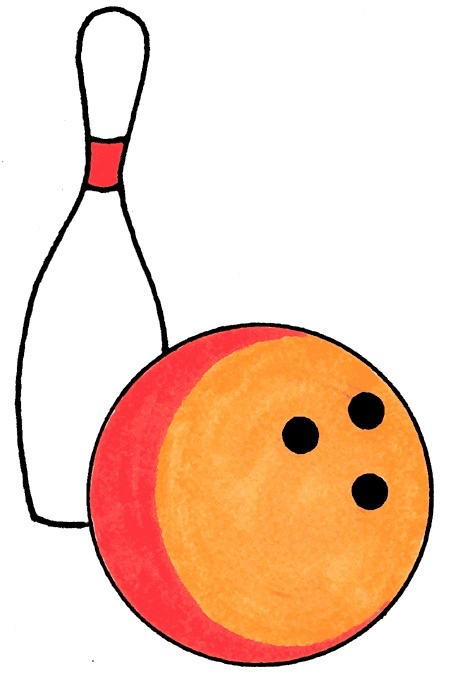 Discuss "The Four Cornerstones of Maximum Bowling Performance"
Bowling league teams sign up; bowl for score. Bowl for score and league play. Prior to next class students should read and print out "Bowling Ball Dimensions and Composition" available on Blackboard. WEEK 5 Mid Term Exam, which includes info from "The Four Cornerstones" (20 points) Bowl for score league play. Review importance of good form and high hand follow through for hitting target arrows. Begin scoring students on hitting the target arrows for spares and strikes. WEEK 7 Review & discuss bowling skills, especially targeting. Q & A. League Play; adjust handicap. 1. To receive an A or A- grade in this class the student must be able to hit the appropriate target arrow 13 out of 20 attempts, 65% success minimum. Grading: the final grade, scored on a point basis. 230-250 points, A*; 225-229 points, A-*; 221-224, B+; 205-220, B; 200-204, B-; 196-199, C+; 180-195, C; 175-179, C-; 171-174, D+; 155-170, D; 150-154, D-, 149 points or less, F.
*Participation: 80 points. 4 points are subtracted from a starting total of 80 for each hour absence from participation in class. *Individual Scoring sheet: 40 points. Statement of Risk: Risk is associated with many of life’s activities, including PAC classes. The College of Public Health and Human Sciences classes will seek to minimize these risks by providing safe activity areas where possible, adequate equipment, and capable instruction. It is highly recommended that you provide yourself with a student health/accident insurance policy. These are available through the University, private carriers, or through a family policy. If uninsured, minor accidents or health problems can lead to great expense. If you have a condition that might affect or be affected by participation in this PAC class, you are encouraged to so inform your instructor either verbally or in writing. Should you become ill or injured during class time, please inform the instructor or have a fellow student do so. If you must leave class because of illness or injury it is recommended that another student accompany you. 6. hit the appropriate target arrow 13 out of 20 attempts, 65% success rate. 1. Turn in the score sheet with at least 2 lines scored. MUST BRING IN A PRINTOUT OF YOUR SCORES. Also, indicate on the back when, where, and with whom you bowled, and comment on the facility and your performance. Bowling additional games during the class time is not considered a make-up. You may use your ‘free’ line (game) for this, but you must turn in 2 lines for a full make up. the tournament, include documentation affirming that you actually watched. (when, channel, how long, tournament, bowlers' names). 4. Ano2. Watch professional bowling on television for at least 45 minutes and turn in or e/mail a one page synopsis of what you observed. In addition to discussing ther option for a make up is to go to a private bowling center and observe league bowling for 45 minutes. For credit you must e/mail me a written synopsis of what you observed including day, time, place, and your comments sufficient to earn participation points equal to class.